In her book "Joyful", author Ingrid Fetell Lee writes about all of the things that naturally give people joy. It turns out that the world around us is filled with things that make us smile. Watermelon is one of those things for so many of us. Watermelon is bright and colorful and juicy. It may evoke fond memories. It may make you salivate. These joyful associations make it a perfect fruit to recreate in crafting. Crochet watermelon patterns can be used to bright lightness and fun to every part of your day. The ten patterns here are top examples. 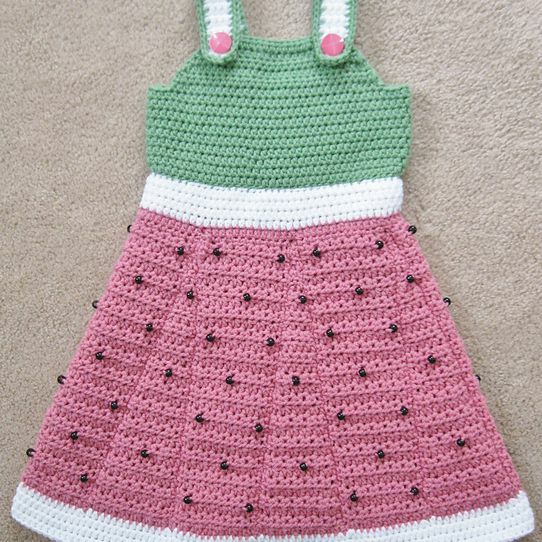 This kids' crochet dress pattern is one of our favorite watermelon-inspired crochet patterns. We especially love how the little pleat designs on the skirt look like watermelon wedges! This worsted weight yarn crochet pattern is designed to fit children sizes 3-4. Bead crochet is used to add texture and recreate the seeds of a watermelon as dots on the dress skirt. This free crochet pattern will make your little one look super cute for summer. It's not just a kids' crochet pattern, though; you'll find size options from newborn through adult. You can wear it in summer or spring, but you could also make it a Halloween costume. Have fun with it! Here's one that is just for babies - a cute little baby cocoon to make your little one look like a summery treat. This is perfect for a summer photo prop or just for keeping baby cozy on cool summer evenings. Many watermelon crochet patterns use beads for the seeds. However, this one uses yarn stitched embroidery-style to create the seeds. This is safer for babies than beads are, which makes it a smart design choice. This crochet scarf pattern was inspired by a watermelon slice. The rind end, crafted with textured stitches in green yarn, measures almost ten inches across. The slice tapers towards the opposite end. This is a very long crochet scarf, measuring 80". You can wear it loose on a summer evening or wrap it around when you need to be warmer. In this pattern, the watermelon seeds are crafted using felt applied with fabric glue. Serve up summer courses in style with this adorable watermelon potholder. Use it at the grill, in the kitchen or at the table when serving up freshly grilled corn-on-the-cob, piping hot burgers, or, of course, fresh watermelon! The potholder has a two-tone green rind that reflects the reality of natural watermelon. The seeds are embroidered on using black yarn. Accessorize any outfit with this cute crochet coin purse shaped like a watermelon slice. This is one of those things that will bring you joy every time that you use it. You'll certainly get comments on it from others as well! The seeds can be made using small buttons that are sewn on after the crochet watermelon has been crafted. Add a leather strap for sophisticated style. This free crochet rag rug pattern by looks just like a little watermelon slice. It is great decor for your kitchen floor. However, you could use it as a mat in the bathroom or even as a fun rug in a child's room. This pattern is designed to be crocheted with strips of upcycled fabric but you could also use t-shirt yarn in the right color scheme to create a softer crochet watermelon rug. The half-circle rug is worked in double crochet stitches, so it's a nice beginner pattern. This is one of those small crochet patterns that packs a big punch. The coasters are simple circles, but the color choices are right on point. The round of white between the rind and the fruit color gives it a polished look. Use these crochet coasters at any summer party. 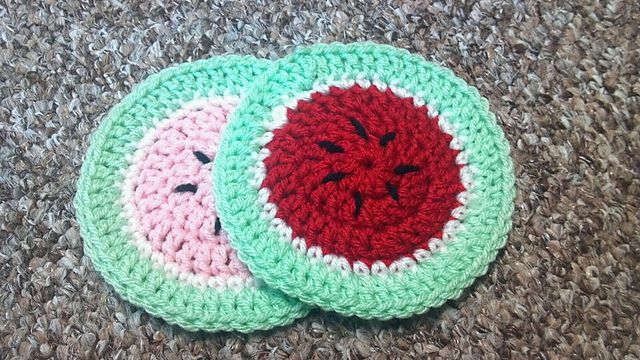 You could even make watermelon punch to go along with your watermelon coasters! Work the same crochet pattern using a larger yarn and hook (perhaps even multi-stranded yarn) and you could create a set of placemats to match the coasters. This is a free Ravelry crochet pattern for an amigurumi-style wedge of watermelon. You can use it for decor. For example, make a set to use as pillows for a spot of color on your couch. Alternatively, this is a great addition to a child's play food set. If you really love watermelon then you can celebrate by making a wreath that looks like one! If you happen to have a watermelon-themed party or room design, then this is a perfect project. It can also make a unique summertime gift. Or simply hang it on your front door to give you joy each time that you return home.